The verb in French for snub is the regular ER verb snober. To remember this imagine that you are SNUBBED by an arrogant French SNOB! Visualize this mental image in your mind's eye like a 'mental movie' to make it more memorable and easier to recall. Combining such a visualization with a cartoon Memory Trigger makes it easier still to remember. 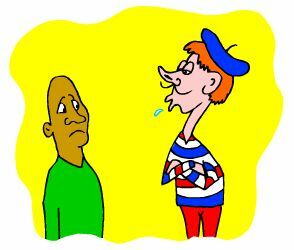 Snober is a regular French ER verb conjugated with the identical pattern of verb endings as 5,000 regular ER verbs. snub! snobe ! snobons ! snobez ! ⇒Learn snober and it will reinforce the pattern for ALL those other regular ER verbs. ⇒ They feature French verbs like the French verb snober - French for snub. ⇒ You can more easily remember words like the French for snub - snober using the techniques of the world's Memory Masters.